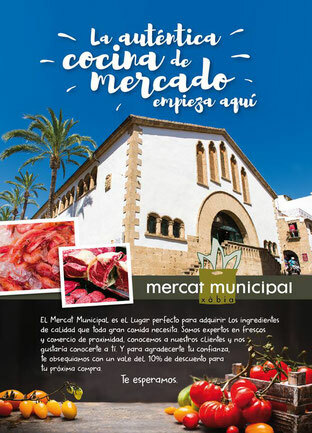 Have you already been to the local market in Javea? It is located in the historic centre of Javea next to the church San Bartolomé in a beautiful building and open since 1946. From Monday to Saturday you can buy here all your fresh products like meet, fish, bread, meat-products, vegetables and fruit and also coffee, tea and flowers. Besides you can have a cup of coffee in one of the bars. The building is airconditioned and there is free Wi-Fi, they offer free parking for your purchases (ask in one of the stores) and your purchased can be delivered to your home. Openings hours (till September 15th): Monday - Friday from 8.00h till 14.00h and from 17.30h till 21.00h and Saturdays from 8.00h till 15.00h.